In 2009 the lava flows from the active Kilauea Volocana shifted east and flowed once again outside of the National Park and near Kalapana. The day the Kalapana viewing area opened in March of 2009, the lava broke out on the surface and cut through the trails they had built for viewing. Viewers were able to get feet from the 2100 degree Fahrenheit lava and the next day the flows went underground again, flowing to the ocean. This type of lava is called “Pahoehoe” (pa-hoy-hoy), characterized by smoother, rope-like, and unbroken surfaces–as compared with Hawaii’s jagged and sharp lava called, “a’a.” In the Hawaiian language the word pahoehoe also stands for satin. 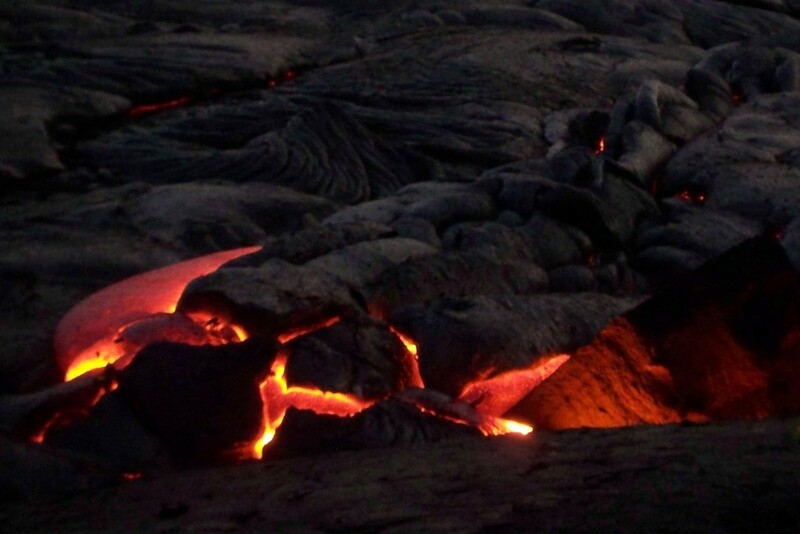 Pahoehoe forms when a volcano’s eruption is hot and slow and the surface is not steep. Pahoehoe lava flows at between 1100 and 1200 degrees Celsius.